»House, Garden and Dogs»Now the Wallaby!! Sorry. The previous post was incorrect in that I forgot to remove the Wallabies part from the title. The Hospital part ran on (ok, so I’m long winded!!) more than I meant it to and I took the part about the Wallabies out. In essence it was that a friend who lives in Tasmania has Wallabies who are frequent visitor to her garden. Recently she noticed that one the regulars ( she named him Rufus) had been injured – probably an altercation with a car. She called the Wildlife Park who sent out two wardens. She assumed that they would tranquillise the animal and attend to his injuries. No so – under Tasmanian Law it is illegal to discharge a firearm (tranquilliser gun is a firearm) within 200 meters of any dwelling. Instead they tried to hand capture the the already stressed animal. I can think of many things I would like to do, but trying to capture a Wallaby (fully grown) by hand is most definitely not one of them :o) She sent me a number of photographs and I’m sure she wont mind if I pinch one of them. I see Kangaroos from time to time and I keep a tight lead on the dogs. These silly things would take off after it or them And I would be unlikely to see them again. About 20 feet away from the end of the road a fence has been erected so we don’t see them as often as we used to – which is sad in one way, but in another it keeps them safe and away from any traffic since it can get busy at times when strange people think this is a through road out to the main highway some seven kilometres away. They stop at the end of the road and come back. I have redirected traffic several times when out with the dogs and pointed them in the direction where the road does go out to join up with the highway. So I take it your wallabies are our deer? 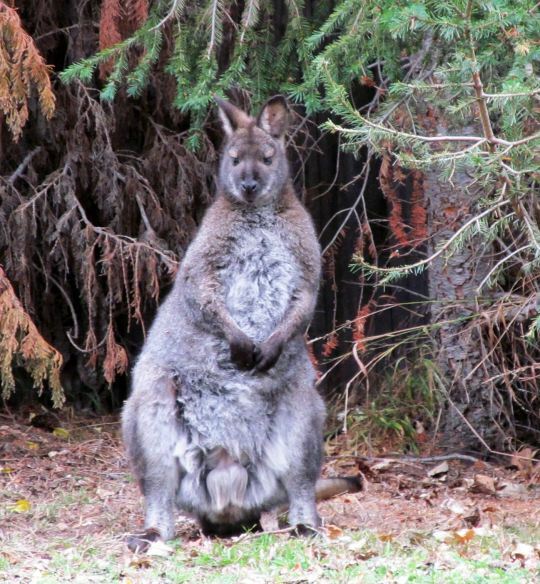 Wallabies are a sort of smaller Kangaroo – still pretty hefty. Here they are confined mostly to the far north of South Australia and ours is a different kind of Wallaby anyway, mostly in the mountain region. In Tasmania it’s slightly different and being an island they really don’t have much in the way of different regions. But if you mean that like deer they wander the roads and at night are attracted to the car lights, then yes.